Late March. CEO of US arms manufacturer Lewis Machine & Tool Company (LMT) Jim Jestel is on his sixth Estonia visit in just a few years. Recent news has it that competitor Sig Sauer has contested Estonia’s decision to give the contract to LMT after several rounds of disputes in the public procurements dispute committee. The original delivery date has been pushed back by more than half a year. Jestel is unfazed by the news. He says that the 40-year-old company that employs some 150 people will move from the small Illinois town of Milan to a new factory just five kilometers away in neighboring Iowa. That is where work is set to begin on the 16,000 rifles procured by Estonia. Jestel says that some parts have already been ordered. Jestel agrees to the interview on the condition that he cannot talk about findings of verification testing because of the ongoing legal dispute. The debate surrounding new assault rifles has been around for months. Is this kind of tug of war to be expected in your business? It is rather common. We are competing for procurements with largely the same people everywhere in the world. Sometimes we win, and sometimes they win. In Estonia, the original procurement had 13-14 participants. By the end, the same three bidders we see today are left. We had a similar situation in New Zealand a few years ago: next to Sig Sauer and H&K we also had Colt and Beretta. What about a win being challenged in court? We have also had that. Things are a little more out in the open in Estonia. Many countries are not as open about their procurements process, and the press does not have such direct access to those involved. So, the dispute at hand has probably been covered more thoroughly. Have you kept an eye on what the Estonian media has reported in terms of alleged faults during verification testing? I have heard about it, but since I cannot read Estonian, I have not paid it too much mind. Our partners over at Milrem have likely taken a greater interest. The entire process has to move through the system, and that takes time. The Estonian people have seen a video of one of your rifles being dropped to the factory floor and a picture of its stock that broke as a result of the fall. Is that material being misinterpreted? That is one of the things I cannot tell you as it is part of the ongoing legal dispute. LMT’s bid undercut your rivals by €5-22 million. Can you simply make them cheaper or was it a strategic decision? I believe it was a good decision for us in many ways. We are talking about a decent number of guns. The mere fact Estonia is a NATO member matters to us. So, to be honest, we followed both strategic and business considerations. You recently manufactured a few thousand assault rifles for the UK and 10,000 for New Zealand. Is the Estonian Defense Forces’ order of 16,000 rifles the biggest quantity you’ve been asked to supply to a single tenderer? Our biggest client is the US government, but yes, as far as single procurements go, Estonia’s is the biggest so far. Please compare the weapons Estonia is procuring to those sold to the UK and New Zealand. The platform is more or less the same, as is the caliber. Simply looking at them, you would say they are identical. The only difference is in how they work: one has a long stroke piston for gas-operated reloading and the other short. Otherwise, they are very similar. That is probably a little misleading. Every procurement comes with a number of extras. We cannot compare cost per item because they also procured other things: spare parts, training. Every tendered has their own demands for training, warranty conditions, optics, silencers. Sometimes, clients only want the rifle. Is LMT underestimated on the global arms market? JJ: I would not use that word. We are a relatively modest company. Looking at the US arms market, companies active there pursue a lot of advertising. That has never been our focus. Most of our clients are members of special forces units from all over the world. We normally do not reveal who our clients are, except in the case of major procurements, like those of the UK or New Zealand. There are a lot of special forces members who do not want to be mentioned. We have confidentiality clauses with many of our clients, according to which we will not disclose how many weapons we sold them, what they bought and in what caliber. We usually enter new markets starting with special forces. Was that the case in Estonia? No. Estonia is an exception in that we did not have any products here before we decided to participate in the procurement. A few years ago, I heard rumors of an upcoming procurement. We met with Estonians during an arms fair and received confirmation. We contacted Milrem to ask whether they would like to represent us. That was in the spring of 2017, and we have been working on it ever since. The motto of your company is “Failure is not an option”. What do you mean by that? Most of our clients are law enforcement agencies and armed forces. We understand that lives depend on our products. Every one of our workers knows they cannot afford mistakes. That is our creed. It turned out last year that some rifles procured by New Zealand had faulty firing pins that resulted LMT replacing them on all 9,000 rifles. What happened? I would not like to go into too much detail. Only about ten pins broke. That is to say very few. We realized there was a problem and replaced all of them just to be sure. You did not want to take the risk. 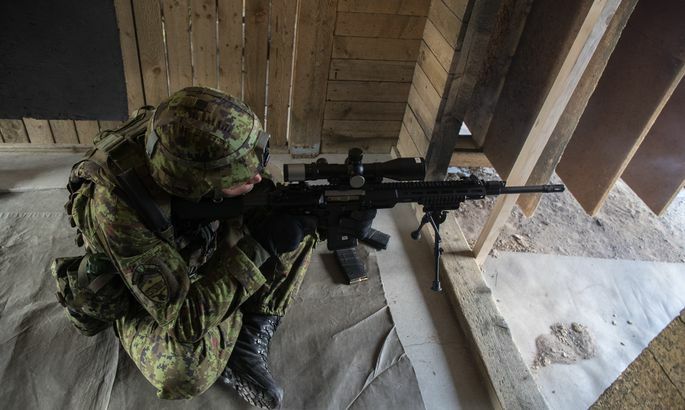 Can we look forward to the same level of diligence should something happen with Estonia’s rifles? Absolutely. I couldn’t sleep knowing a soldier had a faulty weapon. It is personal for me. Following coverage in the media, Estonians are asking whether components of the weapon are of sufficient quality. If in New Zealand, the weapons are being used mostly by professional soldiers, they will be given to conscripts in Estonia, and they are not known for their diligence. How would you assure skeptics? The weapons will not be breaking down regularly. Those who are concerned should contact the armed forces of the UK; they are very happy with the quality and service conditions of our weapons. Our weapons have been used in all wars in Afghanistan and Iraq. They are currently in service in South America, Africa, Asia, the Middle East. Armies there are return customers. We manufacture 98 percent of our components ourselves. We do not outsource production to companies that do not meet our quality standards. Should you ever need to use our weapons to protect your people, your soldiers will have first-class assault rifles. What are LMT’s goals in the region should you win in court? We plan to invest in Estonia, together with our partner Milrem LCM, and have a local center here. We have clients everywhere in Europe, but things are more effective when you have a local warehouse for certain things. We can use our local body to do outsourced work, inventory and maintenance in the region. We are thinking beyond this particular procurement, toward the future.